Pat Webster is passionate about the land. An artist, writer, popular speaker and experienced gardener, she explores the connections between landscape and history throughout her work. Glen Villa Gardens, Pat’s 750-acre private property situated in the Quebec Eastern Townships, provides a canvas for Pat’s love of horticulture and her artistic reflections on the deep history of the land. Site and Insight is a written and visual narrative of Pat’s reflections on art, landscape and how history colours our view of the world, and of the garden. 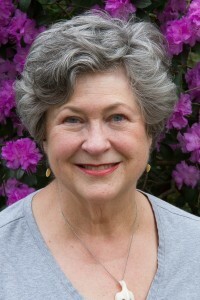 Widely traveled with a deep knowledge of international gardens, Pat has led sold-out garden tours in Europe and writes about the gardens she tours throughout the world. An accomplished writer and speaker, Pat lectures across Canada and the United States. She is also an acclaimed artist who is available for commissions including site-specific installations and sculptures. Gardens are not only about plants and their combination anymore than art is only about the materials used or how they are applied. The practicalities are important: choosing plants that thrive, protecting them from deer and other predators, combining them to bring out the best. But getting these right is not enough. To be truly memorable, a garden needs to grow out of an idea. It needs to mean something. The idea at Glen Villa is intimately connected to the history of the site and to the experiences of the people who lived there in the past and the people who live there now. The Abenaki Indians, the early settlers, the summer visitors, my family: each has left an imprint, either literally or imaginatively. For me, drawing out those imprints and making them concrete adds richness to the landscape and transforms the garden from an arrangement based on aesthetics to a deeply felt present-day reality. The same is true for the art I create. It may grow out of a memory or from some natural occurrence on the land – a lightning strike, for example, or a storm that damages a section of the forest. But always it is rooted in a particular time and place, and in my way of seeing the world. Born in Maryland, raised in Virginia, and a Canadian citizen since 1969, Pat Webster has traveled and studied art around the world. She holds a Bachelor of Arts degree in philosophy from Randolph-Macon Woman’s College in Lynchburg, VA and a Masters of Arts from Concordia University in Montreal, Quebec. An advocate of bilingualism with honourary doctorates from Laurentian University and the University of Prince Edward Island, Pat has been recognized by the governments of Canada and France for her promotion of bilingual education. She was a founding member of Blue Metropolis, Montreal’s international literary festival, and the Fondation Massawippi Foundation, a conservation organization based in the Eastern Townships. She is married to journalist Norman Webster and has five children and eleven grandchildren. She and her family lived in China during the Cultural Revolution (1969-71) and in England during the Thatcher years (1978-81). Gardeners are many, plant collectors are few, but garden makers are a rare breed indeed. Pat Webster is a garden maker and the garden she has created is a landscape unlike any I have visited. The layout is naturalistic but the site is permeated with history. The steady climb through woods and meadows is punctuated with stunning vistas, the discovery of hidden treasures and moments of pure delight. A great site from what appears to be a great garden. Subscribe to this site if you are more interested in challenging and thoughtful pieces about gardens than about gardening, design rather than cabbage growing. One of my favourites. Your talk was wonderful, very informative, fabulous photos and your topic filled the audience with new ideas, I could feel their adrenalin churning! After all, what is a garden for? It is for delight, for sweet solace, for the purest of human pleasures, the greatest refreshment of the spirits of men.” Pat Webster has applied Gertrude Jekyll’s comments to create a unique landscape. Working with a complex site, landscaped over 100 years ago, she has given it a contemporary interpretation, layering whimsy, art and history. Like the garden, her programs refresh and delight. Site and Insight is where I go to find superb landscape design for cold climates. Pat Webster’s sensitive thoughts on the design process inspire me to think more and do better in my own garden. While the rocky seascape of Newfoundland and Labrador seems light years away from a lush landscape in Quebec’s Eastern Townships, Pat Webster’s work transcends these differences. Her lectures and her gardens stir the imagination to see colours, textures, plant groupings differently. Her warmth, enthusiasm, sense of humor and “big picture” vision make you want to rush out and create a landscape…anywhere.